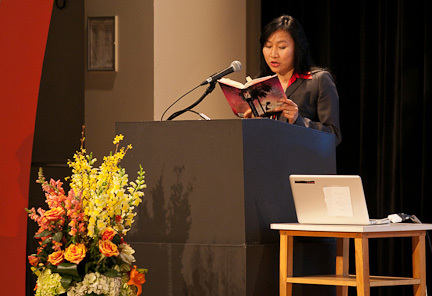 New School professor and Young People's Literature winner Thanhha Lai takes the stage at the 2011 NBA Finalists Reading. Photo by Beowulf Sheehan. For Thanhha Lai, a National Book Award was never part of the plan. At age ten, when she emigrated with her family from Vietnam to Alabama, she had a much more modest goal: mastering English. Decades later, as an adjunct writing professor at Parsons The New School for Design, she has won the nation’s most prestigious writing prize. Lai workshopped five of the poems from that early draft in 2007 in Writing for Children, a summer course at The New School. Fellow students, including Angie Wojak, former director of Career Services at Parsons, were impressed. At the end of the class, Wojak offered to introduce Lai to an editor at HarperCollins, who ended up publishing Inside Out and Back Again. Lai’s journey came full circle on November 15, when she took the stage at Tishman Auditorium for the National Book Awards reading, held on the New School campus each year. The next night, while eating a piece of chocolate cake during the National Book Awards ceremony at Cipriani Wall Street, Lai heard her name called: She had won the National Book Award for Young People’s Fiction. The win, she said, was unexpected. You certainly don’t write to win,, she said.